Owners of M1 Carbines and other .30 Carbine firearms will appreciate the low cost, strong accuracy, and reliable cycling of this ammunition from Armscor. These cartridges fire the traditional load for this caliber: a 110-grain full metal jacket bullet with ballistics comparable to those of magnum pistol rounds. 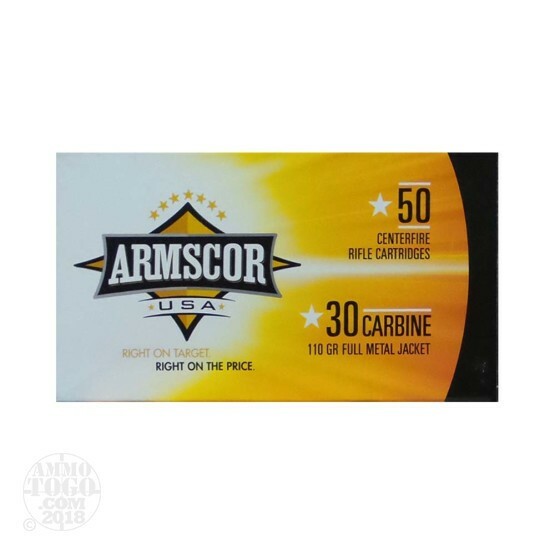 Armscor ammo is made in both the USA (at a facility in Nevada) and the Philippines and uses non-corrosive Boxer primers and reloadable brass cases. These rounds were produced in the Philippines.